Biryani has been a favourite with me for as long as I can remember. It was always a feast food during my early childhood. I would pass by those aromatic biryani stalls in central Calcutta and mentally plan to negotiate with my parents as a reward after my next exams. Several years later, I still yearn for Biryani; having tasted different varieties from different outlets and the quest is on. I was browsing through the book “Biryani” by Pratibha Karan in which she talks at length about various varieties of South Indian Biryani and the name Dindigul using some special rice was stuck in my head. I remembered passing by Dindigul while on a trip to Kodaikanal many years ago completely clueless about its Biryani legacy. 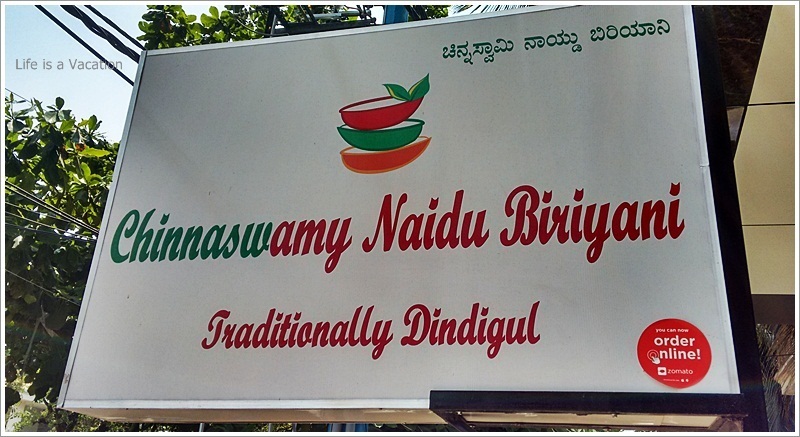 While the best of Dindigul was 275 kms away, I saw hope in Chinnaswamy Naidu Biryani 2.5 kms away from my home in Bangalore. This type of Biryani does not owe its existence to the Mughals and Nizams; it is more of a locally concocted wholesome meal made from best of available rice, fresh spices and country chicken or grass fed goats. On a hot summer afternoon; the staff at the restaurant were more than happy to usher me into their air conditioned dining area. It is a large but spartan place; the kind where you go for the food and food only and not to linger around to soak in ambience. The menu retains its authenticity with regional names for the dishes. It took me a few minutes to figure out that Aattu = Mutton; Kozhi=Chicken; Meen=Fish; Eraal=Prawns. Having done that; I decided to opt for the Aattu combo (Mutton combo) take away so that I get to taste different items along with the Biryani that drew me there. I loved their packaging; the items were handed over to me in a nice reusable cloth bag. While the food is served in banana leaves in the restaurant, all takeaways were packed in arecanut containers. Priced at Rs 290 (excl of taxes) the Mutton combo had a bowl of Biryani; boneless mutton sukha fry; mutton kolambu (gravy); 1 chapati; onion and curd raita; and a glass of jil jil jigarthanda to cool down the spice !! Aattu Sukha or the boneless mutton fry was a killer; succulent pieces of mutton fried with pepper and tempered with curry leaves. It was truly spicy and the softness of the mutton made up for it. I enjoyed the fire on my tongue; on a hot day I love spicy food which gives me a good excuse to have cooling drinks and nap in the afternoon. The light brown hued Biryani is made from Seeraga Samba Rice fluffed up with the spices and juices from the mutton. One gulp and I could feel the flavour of pudina(mint); garlic and coriander leaves and the freshness of the garam masala (cinnamon, clove, nutmeg, mace, cardamon etc). The boneless mutton pieces were soft and had soaked in all the spices very well. Actually, the rice is cooked in the juices released during cooking the mutton to give that uniform feel to the Biryani. After a long time; I had raita where you could feel the curd. Most takeaways give raita which seem like julienned onion soaked in water flavoured with curd :)The Kolambu, gravy was a pool of oil and masala with 2 tiny pieces of mutton. Though I had it with the Chapati; it was completely avoidable. The sweet- Jil Jil Jigarthanda is a cousin of Falooda !! While Falooda is made from Milk, Vermicelli, Sabja Seeds, Rose Syrup and optionally ice cream; Jil Jil Jigarthanda that they served had milk, sabja seeds, kesar, badam pisin(almon gum)for thickness and some nannari sharbat. While Falooda is popular in the north, Jigarthanda (heart cooler) seems to have acquired local hues with the advent of the descendants of Muslim rulers who settled down south. This popular Madurai drink made its way into traditional Dindigul since it is located barely 60 kms away. If you are a true food lover; you will taste everything without being judgmental and then have your favourites !! Go to this restaurant with an open mind; of unlocking the taste of yet another region of India. You will miss the subtle aromas while having this Biryani if you are lost in comparing with Biryani’s of other places. As a techie-travelly-foodie storyteller let me tell you, that the best way to learn about new places, new cultures located far away is relishing their food !! Yet again; blessed to be born in a land of many hues and tastes !! It will be a while till I reach Dindigul for my plate of Biryani from Ponram or Thalappakatti; until then Chinnaswamy Naidu in Bangalore it is. The only thing that holds me back is their price which seems to be higher than other kinds of Biryanis. Location: HSR Layout, Near BDA Complex. 17th Cross, 6th Main Sector 6.